Slice the bottom off the pear so that they will stand upright. Then peel the pears. 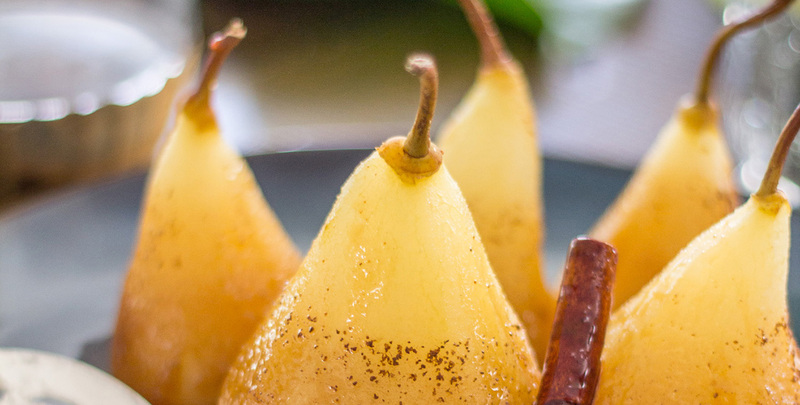 Combine the Holland House® Marsala Cooking Wine, lemon juice, sugar, vanilla, cinnamon, and ground clove in a pot big and tall enough to fit all of the pears. Whisk together and bring to a simmer. Then add the pears. Cover and let simmer for 15-20 minutes, until the pears are soft. Then remove the pears from the pot, and let the remaining marsala wine sauce reduce until it becomes thick and syrupy. This will take about 5 minutes, keep a close eye on the sauce as it reduces, and stir frequently. Serve the pears with the marsala wine sauce drizzled over the top. Bold Boost #32: Adding ½ cup of Holland House® Sherry Cooking Wine to any stew gives this cold-weather comfort fave a dry, nutty and slightly sweet flavor.